Everyone could stand to have a bona fide buddy for Christmas. Not a barroom buddy, who would sadly commiserate, as the two of you cry in your beer, but a buoyant buddy, who would lift your spirits and remind you of the wonder of Christmas. Such a simple (or is it simple-minded) friend may be found this December, in Elf The Musical – one of two seasonal offerings currently being staged at the Olney Theatre Center. Directed by Michael J. Bobbitt (with Production Director Dennis A. Blackledge,) Elf The Musical is an adaptation of the hit 2003 film, starring Will Ferrell. 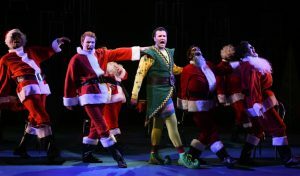 Mostly true to the original, the musical tells the story of Buddy the Elf – an orphaned infant who stowed away in Santa’s sack one Christmas Eve three decades ago, then grew up at the North Pole believing he was an elf. Whispers of Buddy’s true human nature finally fall on the six-foot-tall pixie’s ears, goading Santa to tell the naive young man how he came to Christmastown. Buddy also learns that he has a human father in New York City. So, with a satchel full of cookies and a snow globe of the Empire State Building in hand, Buddy (in his green and yellow elfin wear) sets off on foot from the North Pole to find himself against the bustling backdrop of Manhattan. 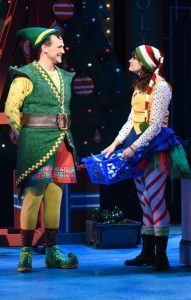 David Schlumpf as Buddy and Patricia Hurley as Jovie in Elf The Musical at Olney Theatre Center. Everything – from a fight with a “fake” store Santa and a few fractious days as an employee of Macy’s, to rejection by the disbelieving father who didn’t know the man-child even existed. Compounding his plight, there is a scowling citizenry who doesn’t believe in Santa Claus; an awkward love-interest with a suspicious co-worker; and a leery step-family Buddy longs to embrace. Can Buddy learn to live in this strange cruel world while striving to maintain his indomitable Christmas spirit? Elf worked well on film, thanks to the side-splitting talents of Will Farrell and a fine supporting cast headed by James Caan and Bob Newhart. Olney’s Elf the Musical works equally well, with the added bonus of superb dancing and some robust rounds in song. Allow me to mention, while we’re speaking of song, that the music in Elf The Musical is not particularly memorable and a bit too “Broadway” for this critic’s taste. The program notes say one song was written in the back of a taxi – no doubt while a Madison Avenue jingle was playing on the radio. In the end, a little of the wildness of the movie is missing. But the triteness of the score notwithstanding, this cast delivers each number with enthusiasm, sweeping the audience along with the infectious tale. David Schlumpf – who nearly stole the show in Olney’s recent production of South Pacific – struck us as an excellent choice to play Buddy. Schlumpf’s elfin self is quite endearing, but he performs the role in a way which appears designed not to overshadow the other players. Buddy’s nature isn’t just enthusiastic; he also has spontaneity and unpredictability. Schlumpf is clearly capable of all of this, but to me, feels a bit reigned in; like he could and wanted to do more. There were some bits that seemed spontaneous and felt real and quite wonderful. Allowing Schlumpf to be a tad more impish would only add to what is already a solid performance. Bobby Smith, as Buddy’s father Walter Hobbs, really grew on this reviewer. Smith took what could easily be a frustrating, one-note part and ultimately layered it into a determined but likable character. One of the more charming numbers in the show – the song “There Is a Santa Claus” – was beautifully rendered by Buddy’s step-family of mother Emily (Janie Sunday) and little brother Michael (Tyler Quentin Smallwood). There is also a skating scene which provides Buddy, Jovie and the ensemble with a pleasant “Gene Kelly” moment on stage. As for the ensemble and supporting cast, Nova Y. Payton (Deb), Calvin McCullough (Macy’s Manager), Lara Zinn (Matthews) and Christian Montgomery (Souvlaki Man) all have their share of golden moments. Give this supporting cast 2-3 lines, and they run with it. Kudos to Choreographer Tara Jeanne Vallee for staging several superb dance sequences, and to Music Director Angie Benson and her orchestra for making the best of the ho-hum score. And a special nod to directors Bobbitt and Blackledge for assembling a stand-out group from start to finish. Overall, this production is a high-quality holiday offering suitable for the entire family – fun with some surprising Christmas magic in the air. The best part of Elf The Musical is in discovering that Buddy isn’t a cotton-headed ninnymuggins after all. 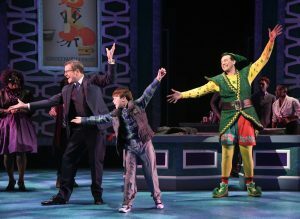 Elf The Musical runs now – January 6, 2019. Running time is 2:30 with one fifteen minute intermission. The theatre is located at 2001 Olney Sandy Spring Rd, Olney, MD 20832. For tickets or more information, visit Olney Theatre Center. And be sure to catch Paul Morella’s unique and enjoyable one-man presentation of A Christmas Carol: A Ghost of a Story – running Nov. 30 – Dec. 30 in the Mulitz-Gudelsky Theatre Lab of the Olney Theatre Center.